Requirements: Owning the Rare Samehada Sword,Level 40,and 500 Experience Points. Samehada Chakra Conversion(### Samehada Chakra,passive) Turns the Chakra into Life/Stamina and transfers it to the Master. Samehada may transfer its Chakra if the Master wishes. Water Release:Exploding Ocean Crashing Tsunami(200 Chakra) Rows C through H have turned into Water.The Width of the Watter mass is 5 Squares wide.Effect last until the Owner has 150 Life Remaining.Range: Current Square. Once per Battle. Samehada Fusion:Shark Body (150 User's Chakra ,passive)The Swordman and Sword fuse together, their Life/Energy are combined.User gains: Sensor:4 Deactivates upon User's decision or at 100 Life. Once per Battle. *Chakra Absorption Skin(Attribute) After an Opponent's Non-Genjutsu/Ninjutsu/Throwing Item hits the Shark Skin, The User will automatically drain 50 Chakra from the opponent. *Human Shark(Attribute)User does not need to breathe underwater and cannot be affected by drowning effects.All Maneuvers may be increased by up to two squares. 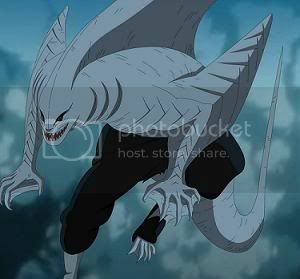 *Spiked Fins(25 Chakra per turn,passive)All Taijutsu Skill this turn gain bleed 25 life for 2 turns. *Martial Water Release:Single Devouring Shark(150 Chakra,150 Stamina) 400 Life Damage,Cannot Avoid/Shield/Interrupt.Three times per battle. *Water Release:Water Prison Shark Dance (250 Chakra)Any Opponents inside the Water Mass will lose 25 Chakra per turn. The Water Mass will follow The Caster,The Caster will always be in the middle.Last until Fusion is disabled. -=Requires Samehada Hilt Fusion to be in effect. *=Requires Samehada Fusion:Shark Body to be in effect. While Saemada Fusion:Shark body is in effect,the User may only use Water Techniques,D-C Ranked Taijutsu,and Energy Amplifier/Samehada Skills.Sword Bonuses are not in effect. Water Release:Exploding Ocean Crashing Tsunami(200 Chakra) Rows C through H have turned into Water.The Width of the Watter mass is 5 Squares wide.Effect last until the Owner has 150 Life Remaining.Range:Current Square. Once per Battle. 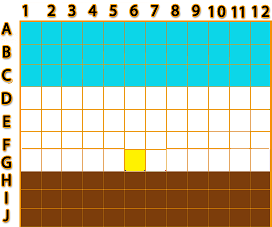 The Bottom of the Water is at Row:H, While the Top of the water is at Row:C.
Since i used the Water at G6,The Length of the Water starts at Column:4 and End at Column:8.